I’m reviewing what new in various flooring alternatives and finding some new possibilities to consider for your retro style kitchens, living rooms, hallways and more. 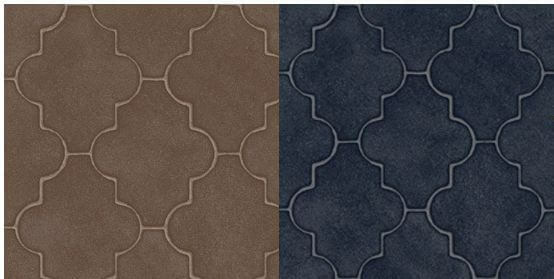 I am really pleased to have discovered this Tarkett Fiber Floor, the Antonia design, available in Taupe Brown or Navy. It’s a resilient sheet flooring — really easy on the feet, super easy to keep clean, likely among your least expensive choices — and hurray: this Persian or Moroccan (?) or Moorish (?) tile design an authentic choice for mid century interiors, especially from the early 1960s onward. 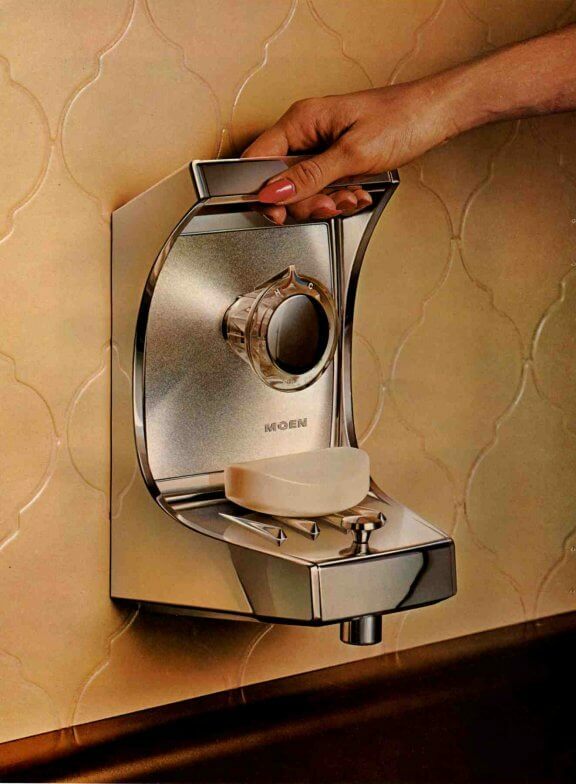 Here’s just one reference photo — from a post I did showing some 1968 home interior designs. Obviously, this is wall tile – but you saw this stuff even more frequently on floors, I’ll hazard. 4,500 of these ceramic Persian tiles were recently for sale on ebay. 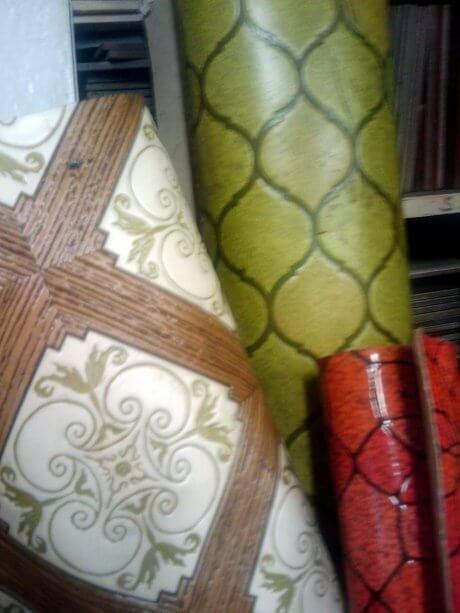 And look at this beauteousness: A bunch NOS rolls of 1960s or 1970s resilient sheet flooring (there are more styles if you click through to the post) spotted by Alison at a salvage place in Seattle. As you can tell, I have a thing for Persian tile flooring – I love it. I’ll keep an eye out, among my marketing materials, for shots of this flooring in place – especially as resilient sheet. I know I’ve seen it. Tarkett’s TechniCore™ foam layer is the key factor contributing to FiberFloor’s performance and quality. This uniform foam layer provides consistency in the size and shape of foam layer cells. Using a unique manufacturing process, foam is tightly and uniformly constructed to provide exceptional protection against indentation and instability across the floor. Tarkett backs its superior performance on all FiberFloor products with long-life warranties that ensure the floor retains its attractive appearance for many years to come. The FiberFloor lines provide 10-year, 15-year and lifetime warranties. Editor’s note: The BEST BUY SEAL is a registered trademark of Consumers Digest Communications, LLC, used under license. On the issue of “This is not your grandmother’s vinyl flooring”, I’d say that in the 1970s — and I washed our vinyl floor every Saturday morning — the floors were pretty darn resistant to ground in dirt and the like. But, the rigors of 5 active children did take their toll after about 10 years, and the floor really needed to be replaced. Would today’s vinyl sheet perform better? I can’t say… I’m gonna predict: Yes. As regards to your grandma’s VCT floor tiles — Ain’t nothing gonna outlast that stuff! Reminder, though: Get expert advice on what’s in your original / old flooring — or if you are going to use salvaged or new-old-stock vinyl flooring. That nasty asbestos can be lingering in the tile, in the the floor, in the backing… gosh knows where…. Consult with a pro to know what you are living with and to make informed choices. Oh holy cow! The fourth picture down (on the left side with the “wood” cross pieces IS the flooring we had in my childhood home. If I remember correctly that house was built in 1968, possibly 1967. It was still in the house when my father sold it 10 years ago. And boy that picture doesn’t do it justice. That floor was uuuuuuuuuuuugly! But I do LOVE that Navy Antonia. I have been looking for the right flooring for my 1958 home and I think that will absolutely fill the bill! Thanks for the find! Underneath the carpeting in our living room is Persian tile sheet vinyl from the mid to late ’60’s in the orangey-brown color. If it weren’t for the asbestos issue, I’d remove the worn-out carpeting and restore the vinyl. Actually, what I’d really love to have is tile like you have in your kitchen. Pam. Love the color and pattern of yours.